I had the pleasure of working with Charlotte Spencer, a contemporary dance choreographer about 18 months ago on a workshop. We did a few exercises to focus in on how we can influence how people walk through a space. Simple yet it had a profound effect on my design work ever since. 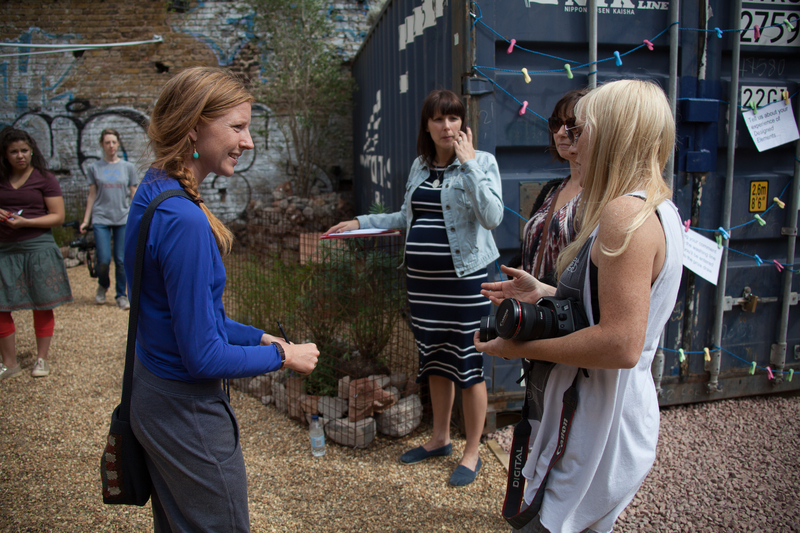 Then we were both approached by Cityscapes and the Siobhan Davies Dance School, to work together to create a garden and performance with young people. We ran several taster sessions in the Spring to recruit young dancers to take part in an intense week long workshop which would culminate in a performance one Saturday in August. Charlotte and I spent a few sessions together exploring each other’s discipline and working methods. We were both very interested in cycles of nature, where something is created from the earth, grows and gets its energy from the earth during its life, has the freedom to effect in someway and then that energy returns to the earth when it dies but perhaps leaves an imprint. Another key thought was, the only way you can get people to really change or to act on something is to make them experience it. I watched Charlotte’s previous work and how the dancers moved and used objects to create. These factors were hugely influential in the creation of the piece and the garden. 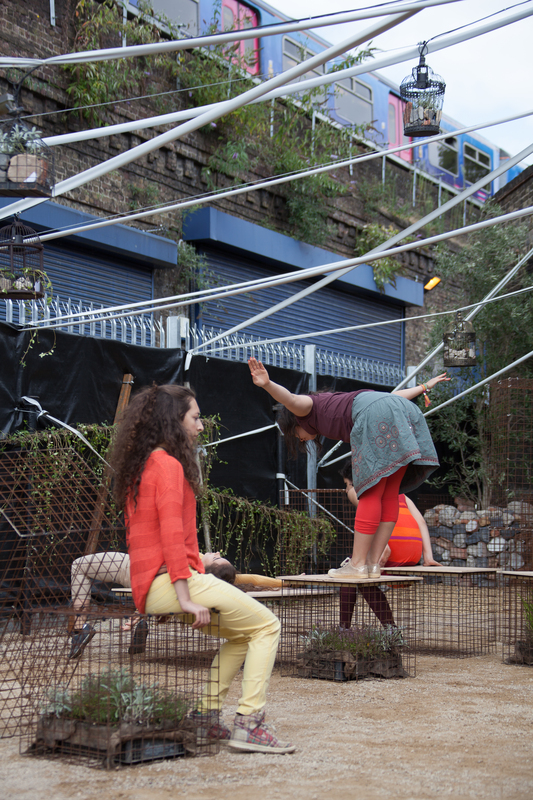 I wanted to ensure that the garden was not just a place for a performance. 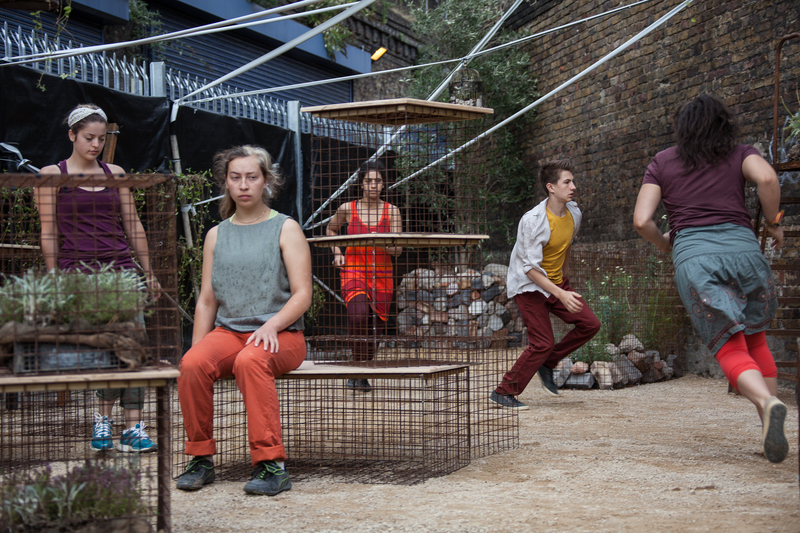 I wanted the dancers to interact with the garden and create the garden and different experiences of it within the performance. The garden needed to be highly responsive to its surroundings and flexible. 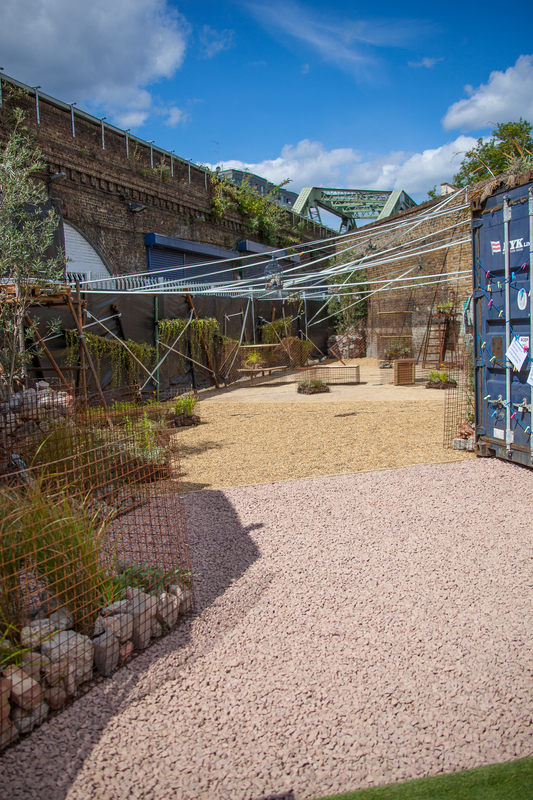 The garden has been created in a wonderful space called The Paperworks, a disused triangular slip of land by the railway line in Elephant and Castle. It is being used as an outdoor entertainment venue by Corsica Studios, with street food stalls, a bar and live music most days of the week. The site was very industrial and urban. It is triangular in shape and there are lots of angles crossing the space. Large rusty skeletal frames dominate the site and this was carried through into the design. Rusty gab ions were created of different sizes, some filled with plants, others not. The dancers were able to build sculpture, jump, roll and move them. The audience could sit on them. The walls had lines of plants creating more angles and I used Pilates tape to criss cross the site, like reams of paper, which the dancers could interact with during the performance. Birdcages with open doors, act as pendant lights through the garden as a little nod to freedom. It was a fantastic project to work on and you can see the performance on this video. The garden can still be experienced as it is open to the public several days and evenings – please visit The Paperworks for more information.